For much of the QSR/fast casual restaurant industry, having a branded mobile app is relatively new and underutilized concept. While some formats (pizza, in particular) were early adopters, the overall landscape remains fragmented in terms of progress, with the various companies taking different approaches to mobile/digital strategy as they first moved to digitize pre-existing business strategies. While the companies are on different timetables, ultimately we anticipate QSR/fast casual own-brand apps will converge around three capabilities: order-ahead, loyalty, and payments. As consumers expect mobile and online ordering, loyalty and payment to be a fully-integrated part of a brand experience, our view is that Panera (PNRA) has moved closest to achieving that goal, having made the much of the initial investment in technology. Late-movers such as McDonald’s (MCD) aren’t precluded from success, but likely face incremental spending requirements. Companies fall behind at their own peril, risking loss of customers who demand consistent innovation. (In terms of late adopters, we look at a company like Sonic (SONC) that in January suggested a “mobile app was under development” and that “going forward we believe we will be able to interact with the customer through our mobile app and then also through a customer loyalty program;” it is clear that the goal of convergence lies much further down the road for SONC when compared to some of its peers). While many QSRs launched their mobile apps to support order-ahead, the integration of payments into the app streamlines the checkout process, increases conversions, and facilitates the integration of payments with loyalty programs (including supporting mixed-tender transactions). This means, for example, that the value of Apple Pay is significantly higher in an in-app setting than at point-of-sale. SBUX, for example, enables Apple Pay for its app (to reload your Starbucks prepaid account, for example) but not for in-store payment (where SBUX uses a proprietary barcode solution, not NFC). However, broader adoption of Apple Pay has drawbacks for QSRs: utility is limited to owners of iPhone 6 (or iPhone 5 plus Apple Watch); card fees are the same as for a card swipe; there is a requirement to invest in NFC-enabled point-of-sale (although this can piggy-back off the POS refresh associated with EMV adoption); and, for now, Apple Pay does not support private-label cards (although these are supported through the QR-enabled Passbook app). Furthermore, enabling NFC at point-of-sale requires a QSR to accept any NFC-enabled wallet including Google Wallet and Android Pay raising concerns about the control and protection of transaction data. This creates a business opportunity for the CurrentC solution from MCX which counts DNKN among its members and will rollout regionally in the second half of the year. Over the next 5 years, we expect MCX to gain a 20% tender-share at member-merchants which, between them, account for $1.5tn of brick-and-mortar sales volumes or ~one-third of the total. We see the winners as FIS which provides clearance and settlement for debit transactions on the MCX platform, and SYF which is well-positioned to provide clearance and settlement for credit transactions. Consensus is that owners of mobile operating systems, so Apple and Google for iOS and Android respectively, can shape mobile commerce and evolve towards disintermediating customer relationships with retailers through platform capabilities such as marketplaces and payments. Recent reports that Google will shortly launch “Shop on Google” to improve mobile conversion rates (by placing a buy button next to the paid search results of participating retailers that, when accessed via a mobile device, will redirect consumers to a retailer-branded product page to handle the order) have rekindled discussion that the role of retailerscould over time be relegated to back-end order fulfilment. SBUX, whose own-brand app accounted for over 90% of US mobile payments of $1.3bn, is dismissed as an exception and the idea that consumers will download and use apps from many retailers rejected because of app-clutter. This view is not consistent with the experience of QSRs as early adopters of own-brand mobile apps (with mobile order-ahead accounting for 20-30% of orders at pizza chains such as Pizza Hut, Domino’s, and Papa Johns) or the more general view among retailers that “app-and-mortar” strategies can allow them to push back against competitive encroachment from AMZN. Gibu Thomas, SVP of digital and mobile at WMT, articulates the opportunity when he remarks: “by 2016, e-commerce sales are projected to get to about $345bn in the US; ‘m-commerce’ sales – online sales through a mobile device – are projected to get to about 10% of that number. But if you look at mobile-influenced offline sales in that same time frame, they are projected to reach more than $700bn”. The business case for retailer investment in own-brand apps arises because digital access can drive demand-generation (by allowing consumers to be engaged earlier in the shopping journey) and can lower order-input costs. PNRA CEO Ronald Shaich comments vividly on the opportunity for demand-generation: “I encourage all of you to sit in one of our digitally-enabled cafes with me at noon and watch the kitchen display system light up like a Christmas tree with orders all within 5 minutes.” More generally, retailers will use mobile apps to combine the convenience of digital shopping (to allow for one-button access to customized orders in the case of QSRs and in-store navigation through planograms in the case of WMT, for example) with the immediacy of an in-store experience. The retailer aspiration is enriched, real-time, and two-way communication with customers through “app-to-app” engagement between wireless- and IP-enabled “smart” infrastructure (including Bluetooth-enabled beacons and NFC-enabled “integrated” or “iPOS” payment terminals) and own-brand retailer apps on customer smartphones. The retailer investment in smart infrastructure to support this app-to-app engagement creates opportunity for vendors such as PAY and NCR, and we expect these vendors to be consolidated into larger technology companies, as Micros was by Oracle in September 2014, given rising R&D requirements, the challenging capital structure at NCR, and the entry into the retail and other enterprise-mobility markets for iOS devices by Apple’s partnership with IBM. Furthermore, regardless of vendor, iPOS software (just like checkout software for websites) will need to connect to acquiring processors through “gateway” middleware creating opportunity for PayPal and VNTV (given its acquisitions of Mercury and Element in May 2014 and July 2013 respectively). The role of mobile operating systems will be to support authentication and help users manage app-clutter (through popping the relevant app to the home-screen based on location and/or time as with Apple’s Passbook, for example). No QSR better illustrates the importance of this authentication role than PNRA. Digital access is a key priority for the firm to generate demand and reduce order-input costs, and the firm supports its own-brand, order-ahead app with business processes to build capacity for the inevitable demand-spikes as explained by CEO Ron Shaich: “as digital access increases customer demand and puts the customer in control of when they want their food without the constraint imposed by a limited number of registers to protect the production, the need for a high-capacity, rapid reaction production system increases”. At the same time as developing its own-brand app PNRA, like most retailers, ideally wants to take payment in the tender form that its customers want to offer and so installed NFC-activated terminals from PAY in preparation for the Apple Pay launch last October, integrated Apple Pay into its iOS app, and introduced a “rapid pick-up” service allowing customers to order-and-pay ahead and then skip-the-line by picking up their orders after a prescribed time from a pick-up shelf. However, the integration with the PNRA loyalty program is weak in that, to earn and redeem loyalty rewards, a customer must enter their user ID and password credentials if using their PNRA app and verbally provide a telephone number for in-store checkout. In both cases, the requirement obviates the one-touch convenience of Apple Pay and the disconnect was highlighted by our local store manager: “it is easier for us to move the line if you swipe a card since we have to enter your loyalty information separately even if you tap ‘n’ pay”. The seamless integration of loyalty programs is the next hurdle for restaurant operators, as traditional loyalty programs are becoming less effective. Loyalty is about identifying and retaining your best customer, and treating them like they are, indeed, valuable to your business. The biggest issue with any loyalty program is churn – it takes time and effort to earn rewards and some, often large, percentage of program participants fall by the wayside. In a survey conducted by Colloquy, it was found that 54% of loyalty memberships were “inactive”. If the goal is to reward your best customers, having them disengage from your program doesn’t seem like a very good way to do it and, just as importantly, churn lowers the quality of the information that you as a restaurant operator should be looking to obtain from your loyalty program. Mobile is the key to reviving loyalty programs, as the program becomes more transparent (progress toward rewards more clear and front of mind with each purchase) and frictionless (no more forgetting your card and not getting credit toward the loyalty program for a purchase). A natural solution to integrating loyalty and payments is for retailer apps to payments-enable their own-brand apps so that app-authentication is sufficient for payments-authentication. Of course, this is the solution pioneered by SBUX which accounted for over 90% of US payments volume of $1.3bn in 2013 (out of total brick-and-mortar sales of $4.2tn for context) and CEO Howard Schultz is unambiguous about his explanation for this success: “we’ve accomplished this by integrating the convenience of mobile payment to a compelling and enjoyable program that gives our customer rewards”. SBUX authentication is seamless if customers turn off passcode requirements since it levers the authentication requirements of the operating system and, in the case of iOS 8, these can be one-touch (since TouchID is available to third-party app developers). The point, here, is that authentication moves into the operating system but payments capability does not: rather, it is implemented by an own-brand retailer app even if through a third-party API (whether Apple Pay, Visa Checkout, PayPal, or CurrentC from MCX). The opportunity for the integration of payments capabilities into retailer own-brand apps is enormous since the removal of checkout friction holds the promise of improving conversion rates which are abysmal on smartphones: for example, the Nordic-based payments-enabler Klarna estimates that 82% of shoppers on smartphones leave the checkout cart without converting it to an order (vs. 66% on laptops). With the intense focus of retailers on app-and-mortar strategies, and with the importance of integrating payments into the loyalty programs, we believe mobile payment is at a tipping point. Our specific estimate is that mobile payments volumes will represent 5% of those for brick-and-mortar commerce by 2017 (and so amount to ~$250bn), and penetration will increase to 15% by 2020. As discussed below, however, the business-case for retailer apps is not replacing the card-swipe (which already works quite well); rather, the business case for an own-brand retailer app is to improve the customer shopping experience and to shape customer purchase decisions early in the purchase journey and through loyalty programs. Having engaged customers in an own-brand app (to enable order-ahead in the case of QSRs, for example, or in-store navigation on planograms in the case of WMT), it is natural to extend the capability of the app to payments since: (a) the app is already running so why make the customer shut it down to open a third-party stand-alone app or a physical wallet; (b) the bundling of payments into loyalty allows the earning and redemption of loyalty rewards to be integrated into the payments stream rather than effected through a side-process; and (c) payments execution via an authenticated app allows a retailer to capture payments data and aggregate it over time into a payments history for an identified, authenticated customer. The latter is not possible for a card swipe, even if the retailer collects the account number, since the customer may use different forms of tender for different purchases and, as we move to tokenization, the account number changes from transaction-to-transaction. QSRs have been early-adopters of branded mobile apps, with the obvious example of SBUX where 20% of US tender is now through the mobile app, because of the importance of reaching consumers early in the purchase-journey (including as a result of commentary on mobile services such as Yelp and Foursquare) particularly for spur-of-the-moments decisions and because of the convenience and faster checkout of order-ahead (particularly to save customized orders such as the salads at Chop’t or sandwiches at Subway). Approximately 30% of consumers order from a restaurant’s website or app at least once a month and approximately one-third of 25-34 year-olds say they expect to be able to use a mobile payment which is now offered by 35% of QSRs. Convenience and speed are the key drivers of mobile adoption according to an American Express Market Briefing from Technomic. Among QSRs, pizza vendors have been at the forefront of digital ordering since the earliest days of consumer internet adoption (see Exhibit 1) and the extension to mobile devices (including cars) and other digital platforms (including smart TVs) is a natural one. Specifically, digital orders are now about half of the total for Pizza Hut, Domino’s, and Papa Johns, and mobile orders are probably half of that and increasing rapidly. The reason is that the alternative to digital order-ahead is phone-in which is highly disruptive to workflows at peak hours. The analogue solution is to add additional hours of labor (as PNRA at a time when phone-in orders were 10% of the total) but this is costly so that the company, through its Panera 2.0 initiative, is looking to a digital solution so as to migrate phone-in orders to digital channels (web, mobile, and kiosk). Domino’s CEO Patrick Doyle sees the order-ahead capabilities of “pizza tech” as a source of differentiation commenting “we are clearly now more than just mobile whether it be smartwatches, smart TVs, or voice-enabled platforms such as Ford Sync and Dom, our virtual ordering system, we are fulfilling our goals of enabling customers to order from Domino’s anytime, anyplace”. While QSRs have taken different approaches to mobile strategy based as they digitize pre-existing business strategies, and are on different timetables, ultimately we anticipate QSR own-brand apps will converge around the three capabilities above: order-ahead, loyalty, and payments. The addition of order-ahead capabilities to the SBUX mobile loyalty-plus-payments app represents this convergence in one direction with SBUX running pilots in the Pacific Northwest and national rollout expected later this year. At the same time, the addition of payment capabilities (through Visa Checkout) to mobile order-ahead by Pizza Hut represents this convergence in another direction. To provide another example, MCD led its mobile initiatives in the US with payments in partnership with the now-defunct Softcard (formerly Isis) payments-consortium between three key MNOs (AT&T, Verizon, and T-Mobile). 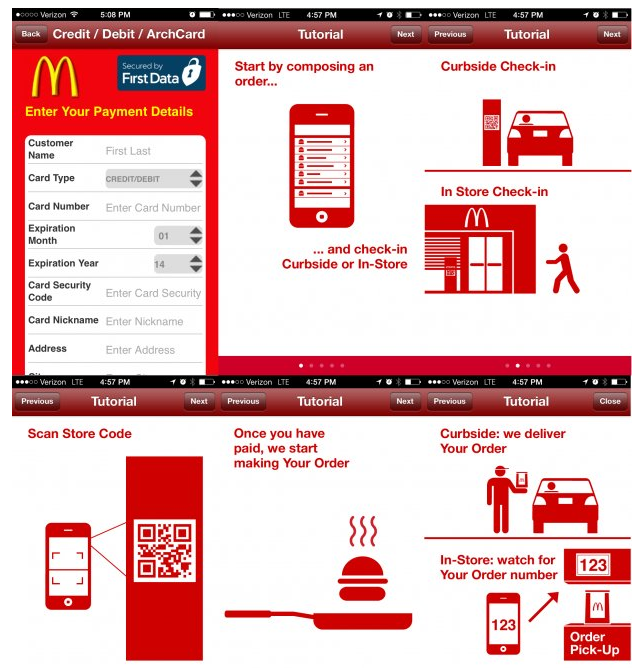 However, MCD is now trialing own-brand apps including a “McD Ordering” order- and pay-ahead app (see Exhibit 2) and a “McD App” for coupons and loyalty offers. PNRA provides another example of convergence. The original impetus for the PNRA mobile app was to enable order-ahead so as to relieve line-bottlenecks at peak hours causing customers to walk away. CEO Ronald Shaich, back in 2012, said: “Walk into our cafes at 12:30 p.m. during the lunch rush, and you’ll see the lines. It’s clear that the demand for our product is not the issue. Our problem is keeping up within meeting that demand with an in-cafe experience that delivers something truly differentiated. Roughly 6 customers per cafe per day equates to approximately 1% transaction growth. Indeed, the difference between the successful or unsuccessful transaction growth at Panera, at least as we hold it, is just 6 to 12 customers per cafe per day.” With “Panera 2.0”, the firm is now extending its order-ahead mobile app to integrate Apple Pay. The upfront investment has been a drag on earnings, as labor expenses related to Panera 2.0 conversions and delivery hub openings have hurt operating margins, but the initial cost isn’t dissimilar to that seen by traditional retail forays into ecommerce. While the investments are weighing on the company’s income statement today, it is reasonable to expect that as more Panera 2.0 cafes come on line and digital sales increase as a percent of total sales, lower labor costs should be a byproduct. In the quarter most recently reported, 9% of the company’s total sales were digitally enabled, with Panera 2.0 enabled cafes running at closer to 20%. We see PNRA’s activation of NFC at point –of-sale as part of a broader trend among QSRs. QSRs that were early to adopt mobile payments did so without activating NFC at point-of-sale. The Starbucks and Subway mobile apps, for example, both use QR codes for payment while the Wendy’s and Burger King apps use tokens (6-digit numbers that appear on the phone screen and must be read by the customer to the cashier to authorize the payment) and Chop’t uses Level Up. Of course, Starbucks (following the launch of Apple Pay) and Subway (because of its acceptance of the now-defunct Isis) also accept third-party, NFC-enabled wallets. By end-2016, we expect substantially as QSRs to have NFC-enabled point-of-sale terminals and for most own-brand wallets to be NFC-enabled so that US market evolves to look more like that in the UK where, for example, the Domino’s mobile app allows customers to receive loyalty rewards by tapping their phone to NFC tags embedded in counter-top promotional material. Indeed, PayPal (which, through Paydiant, supports the development of QR-based mobile payment for Subway and, through its partnership with the retailer payment consortium MCX, Dunkin’ Donuts) has confirmed that it is trialing NFC as part of a “technology-agnostic” strategy. In terms of late adopters, we look at a company like Sonic (SONC) that back in January suggested that a “mobile app was under development” and that “going forward we believe we will be able to interact with the customer through our mobile app and then also through a customer loyalty program.” It seems abundantly clear that the goal of convergence lies much further down the road for SONC when compared to some of its peers. One area where SONC has not lagged however, is in its move to a digital menu board (POPS, or point of personalized service). Probably best discussed under a separate note, the digital menu board, at a cost of $80,000, allows the company to change promotions in a dynamic fashion (based on time of day, as an example) as well as suggest complimentary menu items based on the customer’s order. 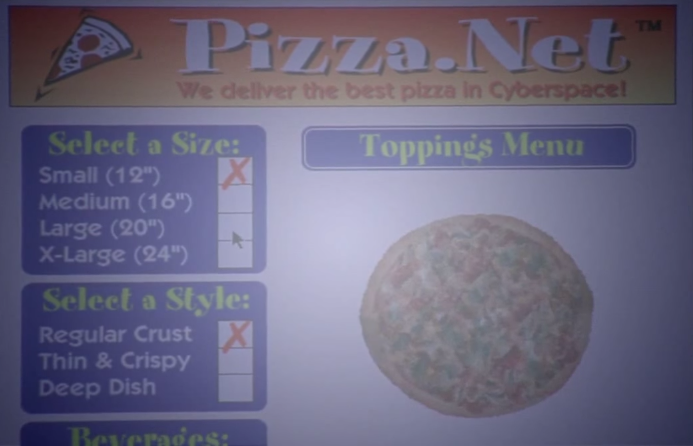 Ultimately, the goal should be that the menu board has the ability to recall a customer’s order history. It’s very clear that, for the industry, there is no shortage of opportunity when it comes to utilizing digital/mobile to create an integrated, enhanced customer experience.